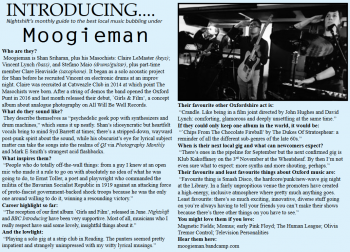 Moogieman is Shan Sriharan, plus his Masochists: Claire LeMaster (keys); Vincent Lynch (bass), and Stefano Maio (drums/guitar), plus part-time member Clare Heaviside (saxophone). It began as a solo acoustic project for Shan before he recruited Vincent on electronic drums at an improv night. Claire was recruited at Catweazle Club in 2014 at which point The Masochists were born. After a string of demos the band opened the Oxford Punt in 2016 and last month released their debut, `Girls & Film’, a concept album about analogue photography on All Will Be Well Records. They describe themselves as “psychedelic geek pop with synthesizers and drum machines,” which sums it up neatly. Shan’s idiosyncratic but heartfelt vocals bring to mind Syd Barrett at times; there’s a stripped-down, wayward post-punk spirit about the sound, while his obscurist’s eye for lyrical subject matter can take the songs into the realms of QI via Photography Monthly and Mark E Smith’s strangest acid flashbacks. When is their next local gig and what can newcomers expect? This entry was posted on 5 August 2017 at 12:45 pm	and is filed under News, Review. You can follow any responses to this entry through the RSS 2.0 feed. Both comments and pings are currently closed.